The Atlanta Falcons selected Virginia Tech quarterback Michael Vick with the top overall pick in the first round of the 2001 NFL Draft. Vick would appear in eight games in his rookie season before starting in 15 in 2002. Vick guided the Falcons to three division titles before serving prison time for his role in a dogfighting ring after the 2006 season. Upon his release, Vick joined the Philadelphia Eagles. Vick was one of 11 quarterbacks selected in the 2001 NFL Draft. With the second overall pick in the 2001 NFL Draft, the Arizona Cardinals selected Texas guard Leonard Davis, who was the first of many future Pro Bowlers selected in round one. At number three, the Cleveland Browns selected Florida defensive tackle Gerard Warren. Defensive end Justin Smith went number four to the Cincinnati Bengals, while the San Diego Chargers selected future Hall of Fame running back LaDainian Tomlinson fifth. Several future Pro Bowlers were selected after the top 10 in the first round of the 2001 NFL Draft, including defensive tackle Marcus Stroud, wide receiver Santana Moss, guard Steve Hutchinson, defensive tackle Casey Hampton, cornerback Nate Clements, running back Deuce McAllister, running back Michael Bennett, wide receiver Reggie Wayne, and tight end Todd Heap. With the first pick of the second round, the San Diego Chargers selected quarterback Drew Brees. Kyle Vanden Bosch, Alge Crumpler, Chad Johnson, Kendrell Bell, Kris Jenkins, Aaron Schobel, Matt Light, Chris Chambers, Travis Henry and Shaun Rogers also went in the second round. Wide receiver T. J. Houshmandzadeh lasted all the way until the seventh round. 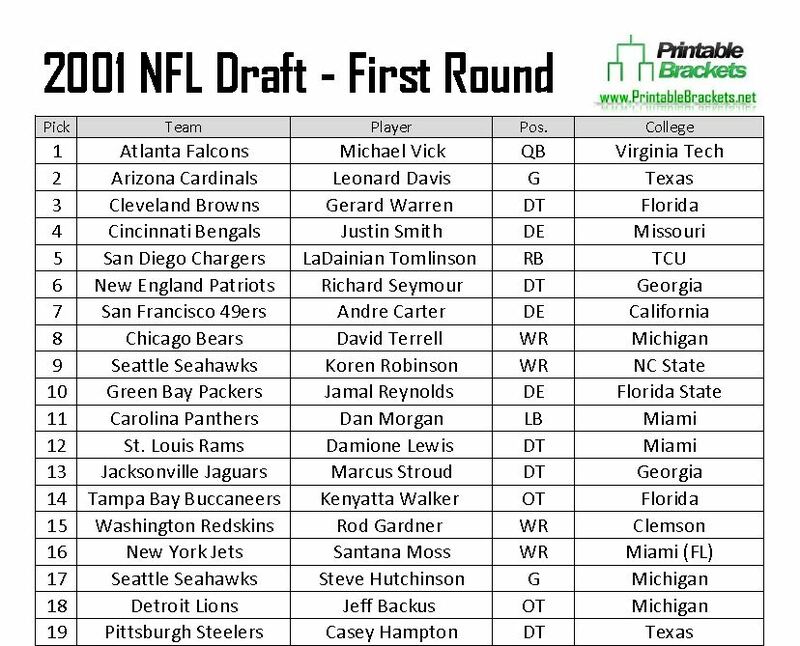 A total of 246 players were taken in the 2001 NFL Draft. “Mr. Irrelevant” was BYU tight end Tevita Ofahengaue, who was taken by the Cardinals with pick number 246. Notable players who weren’t selected in the 2001 NFL Draft include kicker Jay Feely, fellow kicker Rob Bironas and linebacker Antonio Pierce.